Zolt, You did a really great work! I now have the fastest Zeddy I ever had. Thank You! I've tried the ZXMore version of the ROM upgrade - really good though 3D Monster Maze is a little too fast @ 6.5Mhz, but very playable at 3.2Mhz. Mazogs is really good as well, so it looks pretty compatible. I've tried some Andre*** warez. Yoogor is excellent, machine-code speed @ 6.5Mhz. Really impressive. The only issue is the key configuration. The up/down key is too near to the quit key. I tried changing the quit key to zero but for some reason on hitting zero, the shield appeared and it told me that I'd won, but then the BASIC listing is sorcery and I shouldn't meddle as a mortal. 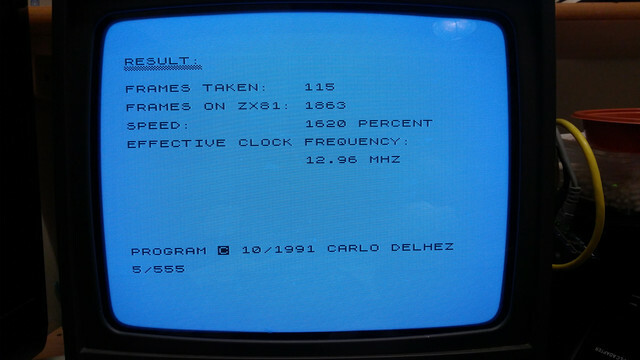 I also tried YATZXEE, which is also close to assembly speeds against a normal ZX81 (at 6.5Mhz of course). I tried some of my own BASIC efforts, as well as Flying Wheel. Excellent improvements, though my Catcher game is a little too fast. I noticed what looks like a small timing glitch on my Fruit Machine game @ 3.2Mhz on the screen redraw, but nothing to be too concerned over. Bounce Redux was tested again for compatibility (developed with z88dk in C), all good. Where do I obtain that speed test program from? You can find it also in the zx81x2.zip/tests folder (ClckFReq.p). I have now tried it on my real ZX81 using the Chroma Interface and a ZXC4 cart, and I am impressed like everybody else - speed coming out of nowhere! @Fruitcake: do you think you can patch the ZX81x2 ROM for the Chroma Interface to allow loading programs via RS232? Fruitcake: do you think you can patch the ZX81x2 ROM for the Chroma Interface to allow loading programs via RS232? I'll add it to my TO DO list. Last edited by zsolt on Thu Nov 08, 2018 5:24 pm, edited 1 time in total. Is there any plan or work in progress so that zxpand(+) user can use that fast ROM.